Congress has demanded the Centre immediately reduce the price of diesel to bring it in tune with the substantial drop in international crude rates. Timing its demand on the eve of assembly elections in Maharashtra and Haryana, Congress said the Centre must bring down the price of diesel to the 2010 level.Congress has threatened to launch “nationwide protests“ if diesel prices were not brought down immediately . Maintaining that crude oil rates in the international market were at a 46-month low at `5,375.30 per barrel, down from `6,318.76 on May 26 this year, Congress spokesperson Ajay Kumar said “despite that the diesel prices in the country have increased by `2.26 since then“. “It is only logical that the prices in the domestic market are also brought down in keeping with the corresponding slide in international rates,“ he said. 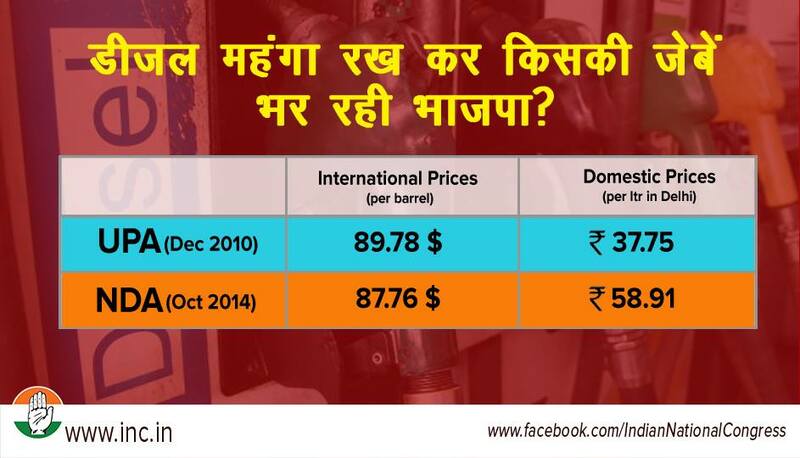 “The NDA government has raised diesel prices by 3.9% on four different occasions since assuming power. When international prices were at similarly low levels 46 months back, the price in the domestic market in Delhi was `37.75 per litre...Sold at `56.71 per litre when the NDA coalition entered office, diesel today is available at `58.97 per litre in Delhi. Claiming that the oil companies were making a profit of `1.9 per litre of diesel on September 30, when the price of the Indian basket was $95.34, while the prices of crude further dropped to $87.76, Kumar asked: “Isn't the government aware that diesel-driven inflation is something that adversely affects the largest section of the population? Why is the government not reducing diesel prices? What is keeping it from passing on the benefits (of the drop in prices) to ordinary Indians?“ Congress also rejected BJP claims about reducing diesel prices and accused the government of misleading people by taking credit for bringing down prices by 50 paise or `1 while oil companies were being allowed to make “obnoxious profits“.